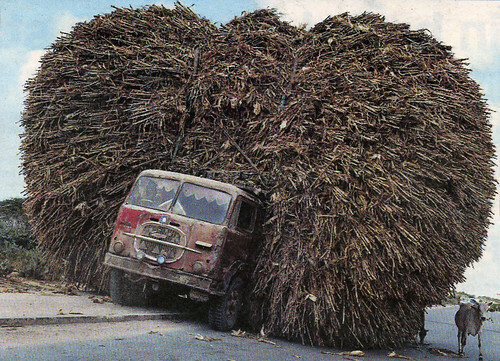 A truck loaded with corn is parked on the side of a road in Mogadishu, Somalia. The delapidated city is the capital of the failed Horn of Africa state, where motorists have the choice of driving on the right or left hand side of the road, such is Mogadishu's anarchy. (Reuters). Circa 2004. I've always wondered about this clipping, taken a few years ago, that The Wife used to have on her wall. At first I thought the scene was staged and that no one could possibly load a truck in this manner except to get the attention of foreign journalists. But it struck me that Somalia has indeed been party to this kind of nonsense for a generation or more thus anything goes - not to mention that this scene is only a matter of degree away from what I've witnessed in my own country, Ghana. It is the very definition of absurd. A relatively famous scene from the Libyan desert circa 1978 (actually isn't Libya mostly desert? ), fodder for picturesque postcards... 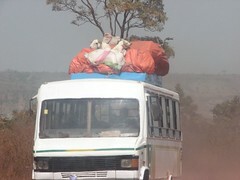 I find the image interesting for the wide variety of bags that are attached to the truck. As you might know bags are my kind of thing. 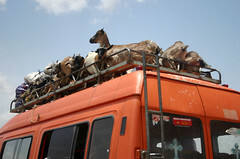 A few months ago, there was lots of discussion about the transport of cattle in Africa. When you have mostly agrarian economies, you use whatever is expedient to transport goods, hence the sight of cattle on roads or on our trucks is nothing special. In the West per contra, you almost never see the animals from which your food is derived. Agribusiness is the rule rather than the exception. You receive your cold cuts of meat in the sanitized glass displays of your grocery store. The network of cattle cars, hog "finishers", meat renderers are an afterthought. Even the word butcher seems to be coming into disfavour such is the alienation from the practice; blood is taboo and it's simply the "meat department" in the grocery store. The last few centuries have seen a sharp decrease in the segment of humanity that has to deal with food production. In the developed world we are reaching neglible percentages and in recent decades, especially in China and India, millions are trading in rural areas for urban slums. We are slowly losing the folk memory of agrarian past. Yet when it comes to food, we still have the visceral connection to the means of production in our ancestral past. That is why it is still theatrical when, every few summers, the French farmers go on strike and bring cattle into town to protest in front of city halls. The strength of the farm lobby will remain undiminished since they can always call on that hard-wired cultural connection. Ever since the troubles in Cote d'Ivoire started, there has been a massive increase in the road traffic in Ghana as the landlocked countries of West Africa, Mali and Burkina Faso chief among them, have been forced to divert their essential trade routes through Ghana. 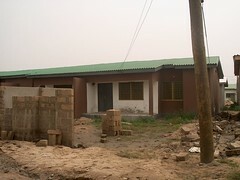 Even after the past few months of stability, it is a case of once bitten, twice shy - the Ivoriens may have blown it for good. The result has been that Ghanaian ports and roads have been struggling to cope with the extra flows. 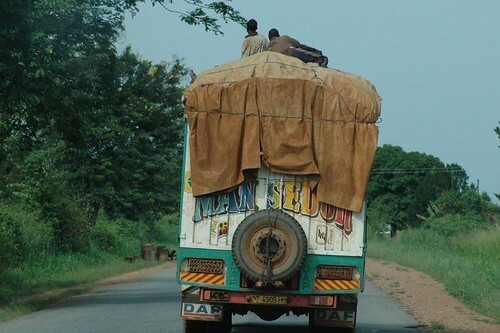 Thus such scenes are a commonplace on the roads from the coast to the north: the heavily loaded trucks and the boys hitching a ride wherever they can. "Man Sit Down" is the slogan, fasten your seatbelts, you want to say. For 30 years in Ghana and much of Africa, we were told by the traditional donors that there was no point to build dual carriageways and that our economies wouldn't support it. Apparently the great infrastructure buildout that separates the developed world from the developing world wasn't on the agenda. Instead we needed to open our markets, lower trade barriers, do structural adjustment and so forth in order to be good global citizens. Now our aid partners are changing their tune and well, those unfussy Chinese have had 15 years of slowly building up expertise doing infrastructure in Africa. They'll be the ones getting the contracts. Now even the DFID (England's development agency) is thinking about sanctioning major infrastructure as opposed to the small scale and NGO-focused approach that has been in vogue... We may even get a West African highway and the long-overdue regional integration out of this situation... Incidentally, only the Chinese seem to be interested in funding railways and it has been a very lonely 6 years for our Minister of Railways and transportation. I've been thinking about Portishead - the band that is, and have been trying to find a way to weave them into the fabric of the blog. Roads, a deeply personal song seems apt as a soundtrack for mass transit. I still remember hearing their debut album, Dummy , for the first time. It was a promo cd lying around the radio station (WHRB) on a pile presumably to be discarded. I threw it in the player and was frankly stunned when I listened to it. The first element of their appeal was a voice that seemed slight, ethereal and perhaps pained (or at the very least emotional). The lyrics come from some kind of turmoil deep inside Beth Gibbons. The drums are in the hip-hop vein, yet laidback and lazy. Geoff Barrows added all sorts of sonic niceties that befit a Bristol crew - samples of film dialogue, Isaac Hayes snippets, scratches, guitars and moog keyboards that made you feel you were in an old-fashioned movie theatre screening a film noir. Of course we know that this became a "genre" and record companies quickly labeled works of this type "trip hop" that was a subplot to the 90s and indeed Portishead's music would be picked up in movies. There wasn't a cover booklet with the cd which meant that it took some investigation to figure out the other ingredient that had so tickled my ear. The secret ingredient, the secret sauce, of the group was the theremin: it appears on perhaps a third of their songs - hence the cinematic connection. Listening to Portishead play Mysterons or Roads is unnerving. You can hear the audience reaction on the Live: Roseland NYC album. The music is well, how to put it, haunting, mournful and more. It's the essence of the noir aesthetic - mood and cinematography translated to sound. To me the theremin (or its Moog substitute) straddles worlds, creeping up on you and drawing your attention to something that lurks beneath, or that dwells in the shadows. I find comfort in the shadows of this music. Oh, and I still don't have the dust jacket of that first Portishead album. We the people, having survived for so long on so little, and done so much for so long, are now qualified to do anything... for nothing. I found the above musing in an old notebook of writings circa 1992. Spring cleaning, even if delayed until summer, does turn up the occasional nugget. It put me in mind of wist, hence some further musings on indigo moods. 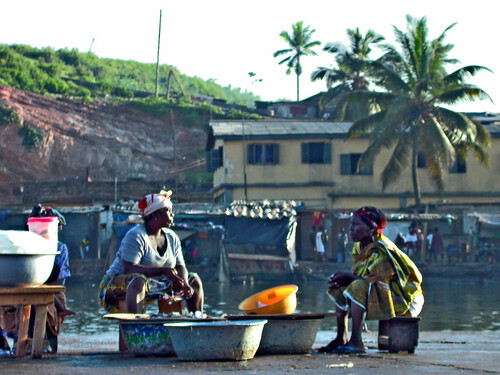 The above painting reminded me of the following photo from the African Futurist of fishwives in the morning in Elmina, Ghana. The stories they have to tell, the perspectives they could share. I want to have a conversation with them, simply sit with them in the middle of the day - in the brief moment before they get back to the important things on their plate. We the people indeed. 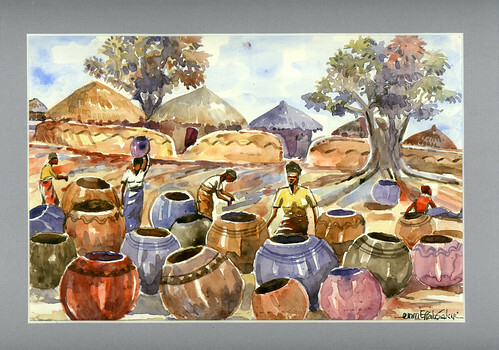 It also brought to mind the women who were dyeing cloths in those courtyards in Bamako, Abderrahmane Sissako's film that is, while the World Bank and international institutions were being put on mock trial in the foreground. The women and their work were meant to be the background and yet, from my standpoint, their stories and experiences were the foreground. Wist is perhaps the attitude that best suits these unsettled times, we are all holding our breath and tightening our belts, bracing ourselves for who knows what. In the USA especially, I sense a lot of wist in the air. Conveniently timed gut feelings abound all round, we have banned liquids and have to resort to zip-loc containers and long lines. Americans now need visa stamps and even passports. Heck, you can't even get out of the country if you want to without bribing passport expeditors or calling your congressman. When you take that trip to Brazil, you'll need to give up your biometric data, the reciprocal wages of bureaucracy and inconvenience, just like those visitors to the States have had to since it became a matter of Homelands and Security. If you stay in the country who knows who will be watching you or listening to your conversations. When you're on the subway, you need to be mindful of recent non-specific general threats. Suspicious people are everywhere - they could even be (gasp) next door! I think a lot of wist is in order. There is a danger however: when wist devolves into nostalgia it becomes reactionary. Too much wist and you start dwelling on those good old days that never really were. Your thinking will get wooly and, without moderation, you are liable to be bamboozled into who knows what and then be left picking up the pieces, singing the inflation calypso as the chickens come home to roost. You really don't want your entire society to start behaving like actors in B-movies. The director may not cut the scene. Hold on to wist I say. Wist is clear-eyed and lyrical. Wist is wary, wist is weary, yet while being realistic, wist embraces the here and now, the tense present and a better tomorrow. At heart then, wist is an optimistic sentiment. The dictionaries present the word wist as obsolete and would direct us to to its adjectival compere, wistful. Of the latter I prefer the meditative, pensive and forlorn senses, but of the former, it is that still small voice of wist that attracts me, that quiet and attentive outlook. In my book, wist is stoic and, at its best, eschews melancholy. When wistful, one is pragmatic yet hopeful. The British and the French know a lot about wist as their empires have seen better days. Others however are still seeking the black gold of the sun. Would they take a moment to be wistful? Wist is about humility, about acknowledging the small steps towards the wonders that are still to come. Wist presents an opportunity for resolve, it is a brief respite in that moment as you gather yourself up for the next task, the next struggle. Wist is a flight to quality, a premium bond for these subprime times. Wist is soul insurance that actually pays you back when you file your later claims. I'll prognosticate here. Those in the developing world are actually at an advantage in these wistful times. Of necessity, we are aficionados of wist, world-weariness has long been our lot. A lifetime of almost always expecting the blows coming your way will leave you better equipped to deal with this harsh world. The school of hard knocks is our neighbourhood and our response is communal not unilateral. Sissoko would say "we are all responsible". One shouldn't strike out on one's own just because one can, rather we find strength in community. Burning Spear would add: social living is the best. Musically, the quality of wist is a step up from the blues however the blues tend to get more love since they are more dramatic and keenly felt - wist is merely transitional. In compiling a wistful playlist for this note, I initially thought to songs about holding on. To "hold on" is indeed the most resolute response to wist and I have many songs on that theme (Lisa Stansfield, Dennis Brown, Ann Nesby, Dwele and others can school you for a good hour about holding on). Shuffle serendipity struck however and instead I found my wistfulness encapsulated in the following songs. This song is perhaps the definition of soul music - the point at which the genre coalesced and departed from gospel and the blues. It is fitting that wist was the first vein in which Sam Cooke made out his soulful sound. There is both a spiritual and a bluesy feel to the song. Watching Talk to Me last night, that wonderful film about the life of Petey Greene, that ex-convict turned radio disc jockey, it was no surprise that A change is gonna come was the song that he played to sooth the soul on the airwaves in Washington D.C. that night after Martin Luther King Jnr. was assassinated. It speaks about optimism even in the face of setbacks. The vocal performance is one that few can equal although many have tried. A few sublime minutes of yearning and longing (the obligatory youtube link). The Indigos album is one of my favourites in the Ellington catalog, featuring wistful tunes throughout. The only vocal track on the album is of course Autumn Leaves that paragon of remembrance (see also the autumn soundtrack). Prelude to a Kiss is all about the lyricism of Johnny Hodges, as is the old faithful, Solitude . The song I'll highlight however is the title track, Mood Indigo . An economy of emotion, it features a perfect trumpet solo full of whimsy and reflection by Shorty Baker. That wondrous portion when the rest of the band join in is ecstatic. An earlier performance is on youtube with Jimmy Hamilton Willie Cook (see corrections) doing the deed on trumpet and with a more prominent piano solo by Ellington. Indigos are not quite the blues and the Duke's band prove that indigo is the colour of wist. The crown prince of soul put it on the line seven years ago. The elements of the song are simple: Questlove's steady drums, James Poyser and D'Angelo's keyboards and Rhodes, a little boom bap from the bassist and above all the vocals. I hear Sam Cooke, I hear Al Green, I hear Prince, Curtis, Donnie, Marvin and more. It is a tour of the sounds of his favourite vocalists wrapped in his own stylings. It's the moment of truth, the stakes are high ("Will I fall off or will it be banging? "), he steels himself: "all I got to do is hold on". He'll stick to his guns, resolute to the challenge ahead. Perhaps the hungriest of the young lions of jazz, James Carter can also be the most tender when he want to. The musical scion of Coleman Hawkins and Ben Webster, he isn't afraid to engage in matters of the heart, albeit with a wink and a certain swagger. Hence this song is a study in contrasts: the wistful tone of the music set against the premise of the overwrought title. After a fairly subdued opening solo, the piano takes over and the bassist prods him along and what a piano solo. When Carter's saxophone returns wailing, or rather growling, the notes are urgent, longing and attentive — wistful in short. One hopes his woman forgave his missteps, the music is a plea for a renewed intimacy. Apropos tenor saxophonists, there is another version of Mood Indigo that I'm very fond of: this intimate meeting of jazz giants. Ellington introduces the theme on piano and the band step in smooth as usual. After a while Coleman Hawkins steps up and delivers the goods. His solo is discursive, breathy and virtuosic. This is someone who has lived body and soul. Duke's accompaniment is subtle, encouraging Bean to find the emotional depth in the melody. Simply magic. Mingus recorded Mood Indigo twice, recognizing as he did, the genius of Ellington's composition. Each occasion elicited typically sensitive bass solos from him. I'll focus here on his own composition, Goodbye Pork Pie Hat , his tribute to Lester Young, written right after he learned of Pres's death. It captures the mournful and elegiac tone of loss, Mingus' great band remembering the arch tones and oblique art of their friend who paved the way for them. In the hip-hop vein, I suppose the closest would be Pete Rock and C.L. Smooth's They Reminisce Over You (T.R.O.Y.) although that arguably leans more towards nostalgia than wist. The lead single of last year's opus, Morning, this song takes on the notion of hard experience in life. She takes her time to warm up as the song progresses and only really starts letting her hair down vocally at the midpoint. She's in control throughout observing the vagaries of the mood, a midtempo soul excursion. Watching the video (slightly lower quality on youtube), you see that she has a lot on her mind ("A woman is getting weary"). Ultimately she finds comfort around her friends and family as it should be. The song ends as it starts with Amel walking down the road. Perhaps the weariness has been lifted, in any cases she has given us music for a long walk. The most important thing of all is that no matter how dreary the situation is, and how difficult it may be, that the song really doesn't matter until the song begins to get you down. So our advice to you, the message that the Cannonball Adderley Quintet brings to us, is that it's rough and tough in this ghetto, a lot of funny stuff going down. But you've got to walk tall. Wist, the ineffable sentiment for our times. The Wife and I have been thinking of buying a house for the past year and, since spring, have been mostly bemused at the huhudious prices that were being quoted to us (with straight faces, mind you) for mostly depression era houses. Thus we've been getting an education on the hard sell during our few months of attending open houses, and also some lessons in home economics. Note: prudent ™ denotes a conforming loan and home financing deal that wouldn't raise the eyebrows of even the staidest banker. Note: the days of 20 percent downpayment have been out of fashion for a long time (we live in a subprime era) so we'll relax our stringent banker conservatism and use a 10 percent downpayment as our baseline. 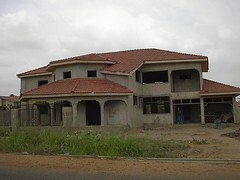 This reduces the maximum prudent house price to $463,333. Note: the conforming loan limit of $417,000 is the maximum federally-insured mortgage above which point we are in the realm of jumbo mortgages which have all of a sudden become quite scarce. The median price of housing listed in the Bay Area was said to be $785,380 in February 2007 when we started looking in earnest. That was the listing price and not necessarily the sale price but, regardless, that was sticker shock by any definition. In June 2007, the median housing price paid in the Bay Area was $665,000, a new peak. See also a trend graph of an earlier data set. The typical monthly mortgage payment in the Bay Area was $3,219. "adjusted for inflation, current payments are 24.0 percent above typical payments in the spring of 1989, the peak of the prior real estate cycle." Jumbo mortgages "represented 62 percent of the purchase loans" made in the area. Putting these things together, it is clear that something does not compute. The force of gravity will make itself felt and the $200,000 gap - the fat on which the housing sector in the Bay Area has been feasting on for the past 15 years - will of necessity be closed. The only questions are how much the gap will narrow and how long it will take. 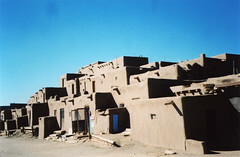 The typical price of the only reasonable houses we have seen during our search was $750,000 (The Wife has called much of the rogues gallery that were shown to us "illegal dwellings"). We thought we'd seen an overheated market in Boston but the Bay Area has redefined our perceptions on that front. A software engineer and history professor ought to be able to afford a starter house. The hard sell and the real estate shell game was in earnest and it was as if the whole town was in on the con. The pinnacle was the university housing officer who advised her academic client that we could easily afford a $700-800,000 mortgage - if you ran the numbers, monthly housing payments (circa $5,000) would far exceed the salaries of most academics which prompted said academic's quip "I'm not going to spend that much on a depression era bungalow" to the surprisingly-shocked agent. I suppose I would have put it as the Emperor has no teeth. There's lots of moral hazard in the mounting chorus to bail out the fiscal wizards. Many are lobbying for the limits on Fannie Mae and the like to be lifted or for interest rates to be cut. Sidenote: the language of financial panics is always interesting: credit crunch, mortgage meltdowns, debacles etc. Fed chairman Ben Bernanke has been known for his "cautious experiments" in the past and will surely come up with some kind of intervention. When well-heeled bankers start invoking the spectre of millions out on the street you can almost hear the subliminal "think about the children" message. John Kenneth Galbraith is sorely missed. In any case, we continue to search for a home... For the first time last week, we saw advertised a condo in a nice neighbourhood that was priced under the new mathematics at $469,000 - some sellers obviously need to cash out quickly (similar houses were priced at $650,000 just a few months ago). Hopefully we'll start seeing more of these things and it might even become a buyer's market. I won't hold my breath however; there's a surplus of unreality in the Bay Area. In closing I'll note that Ikea was packed last weekend — everybody is doing home improvement, it seems. I don't think much of it was about putting a shine on show houses that you needed to flip ("one last try"), rather I suspect that it was belt-tightening at work, and making do with what you have. Time will tell and we'll be waiting this one out in our rented nest. Dionne really came into her own when she sang the Burt Baccarach songbook. It was a sublime case of pathos, operatic pop as it were featuring Baccarach's lyricism distilled in that delicate voice. All her later monetary triumphs stemmed from the magic of those wonderful interpretations. I was going to pick Money Jungle by Duke Ellington, Charlie Mingus and Max Roach for this playlist - the song (and album) is suitably jarring and tense, but I thought that Kool Moe Dee would be more appropriate. The title of the album is a key indicator: Knowledge is King. Laymen are always the last to get bailouts hence education is key to prepare for the periodic shocks of the grifter impulse. They Want Money is the soundtrack for Jim Cramer's crew, its blaring horns an ode to Alan Greenspan's politically expedient teaser rates, its rapid-fire lyrics are dedicated, with respect, to all those who have been selling a bill of irresponsible goods in the housing market. I really need to do an appreciation piece on Luther who, like Aretha, had the uncanny ability to make any song his own. Simply put, his version is the definitive version - it's not even close. Soul music with all the accoutrements, lush and emotional. A house is not a home, how true. I've been mulling a piece on Africa in 1989 to give some depth to my ongoing series and trying without success to find the equivalent poster from that year - the high mark of rogues in Africa, hence I'll start with a request: does anyone have any similar photos from 1989? Photos of any OAU meeting would work for my purposes. As to the matter at hand, I suppose the more recent history of 1999 will do as a stopgap measure. Posters of this sort are quite popular in Africa (large size), you'll find them at many of our newstands. I don't quite believe in the Great Man theory but, when it comes to Africa in 1999, one has to admit that leadership still mattered a lot unlike in other regions of the world. To take an obvious example, no one in their right mind would be putting up similar photos of EU leaders on the walls of their houses. Public apathy to leadership in the West is rightly the norm - modulo the occasional gremlin. 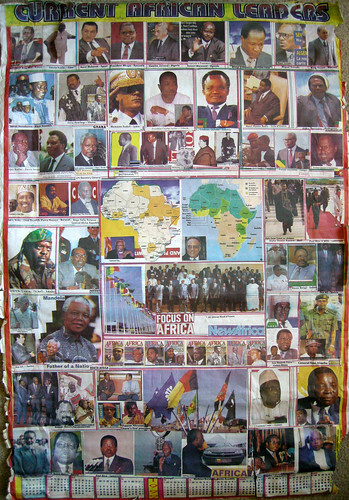 In West Africa especially, where we know all too well about Big Men - and they are all men in the calendar, Ellen Johnson Sirleaf was barely on the horizon at that point, these posters serve as a kind of palliative: "Get to know your local strongman", wear their political cloths and so forth. Even the good guys were larger than life in 1999; that was the year Nelson Mandela stepped down as president of the New South Africa proving his George Washington bonafides, the Good "Father of the nation" as the poster notes. In 1999, we didn't have many technocratic Thabo Mbeki or John Kufuor types as we do presently. Instead you'll note a lot of military uniforms and panache. The 2007 contingent are a mostly dour bunch other than say, He of The Little Green Book - Gaddafi that is, or Robert Mugabe , and Bad Bob has always worn a gray suit since hanging up his rebel spurs. That dourness is paradoxical progress, you don't want to live in revolutionary times. By contrast the typical words used in the western press about our leaders in 1999 were things like "mercurial, flair and flamboyant". Strictly speaking it's not 1999, the calendar was produced in late 1998 as evidenced by the presence of the late, unlamented General Sani Abacha of Nigeria on the right hand side who died just months earlier. When people literally celebrate your demise to the point of dancing in the streets (as they did even in nearby Accra, Ghana), you've obviously been smothering them. Still the 1999 crop of African leaders were a definite improvement on the 1989 crop but you could still see a high percentage of strongmen, thieves and incompetents. Even with the comforting gaze of Kofi Annan and Desmond Tutu ( Julius Nyerere and Kwame Nkrumah are on hand to round out the nostalgia quotient), there is precious little comfort in this poster. Charles Taylor (top left) was then president of Liberia, a decade after starting his mischief in the sub-continent. He had reached his peak of warlord power having coerced a terrorized populace into voting for him or else. And it was a case of "or else" that he proceeded to display: the white suits were flowing, the timber and blood diamonds were in abundance, the concessions had been granted to Pat Robertson, and the flowering friendships with Jesse Jackson and company proceeded apace. But he wanted it all, so Sierra Leone, Guinea and even Cote d'Ivoire would pay the price. May he suffer a lifetime of legal action, and the company of lawyers and bureaucrats. Gnassingbé Eyadema , the Prince of Darkness is ominous at the bottom right and for once depicted without his dark shades. To this day none of my Togolese friends discuss politics with me, so long a shadow does he (and now his progeny) cast. Jonas Savimbi, Jerry Rawlings and Gaddafi are their customary gremlin selves - merchants of grist. Jammeh of Gambia, in army gear (red cap just above the Africa maps), is holding up a little prop (sorry, I meant a little boy) - he wasn't claiming to cure AIDS back then (as was the case last year), but the visions of grandeur and the lucrative arms smuggling were going well. The leaders of the various Guinea countries were grim. Conte of Guinea was simply corrupt - he still is. Joao Bernado Viera of Guinea-Bissau, having survived a 1998 coup and minor civil war, was cracking down on the opposition - he would fall in mid 1999 (he is back in power currently). The less said about Teodoro Obiang Nguema Mbasogo of Equatorial Guinea the better - 1999 was a typical year for his brand of malfeasance. Al-Bashir of Sudan with the army uniforms behind him headed no-nonsense and efficient killers. Buyoya of Burundi wasn't up to much good. The military leader of Niger, Ibrahim Baré Maïnassara would be assasinated in April 1999. His replacement wasn't much better. The biggest disappointment was Henri Konan Bédié of Cote d'Ivoire who was ensconced in that most comfortable chair. Despite being groomed for decades by Houphouët Boigny, he wasn't up to the task. His country is still paying the price for his small-mindedness. Frederick Chiluba of Zambia (arms crossed and self-confident) was quickly losing his democratic lustre - he would be voted out of office a few years later and continues to face corruption charges. Abdou Diouf of Senegal is an odd one. Ostensibly a democrat, he eventually handed over but he was increasingly autocratic the longer he was in power. The Ethiopians (Zenawi) and Eritreans (Afewerki) decided they needed to engage in pointless border wars and old-fashioned trench warfare ensued. Tens of thousands perished. Museveni was sowing his mustard seed in Uganda - democracy was for chumps in his considered opinion. One party state, baby. 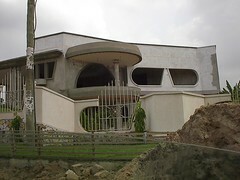 Kerekou of Benin still can't point to any thing that he's done for his country; in 1999, the priorities were clear, it was all about the money. These posters are of the cut and paste variety and were put together in a hurry; sometimes one forgets to update things or misattributes. Thus Habayarima Juvenal of Rwanda, who had been killed to kick off the 1994 genocide, is still listed. Paul Kagame should be annoyed. For Burkina Faso there is also the image of supposedly saintly Thomas Sankara , killed a decade earlier. File under misplaced nostalgia. The Swazi king and the Lesotho prime ministers aren't listed for whatever reason. Sierra Leone in 1999 was all complexity. President Tejan Kabba clearly had a precarious grip on power, the evidence being the enigmatic "Sierra Leonean rebel leader" in green beret and army fatigues on the left hand side who appears ominously on the same poster. And indeed Sierra Leone was in the midst of its long civil war. In the other Congo, the situation was confused and confusing. Patrick Lissouba is depicted in the poster although he had been overthrown by that other gun runner Sassou-Nguesso ; his militia did came close to overrunning Brazzaville that year. Years later, one assumes he is still itching for a return from exile. Somalia, after a decade as a failed state, gets any number of warlords on the poster: Aideed, Ali Mahdi are the convenient stooges. Not depicted is Monsieur Bin Laden who brought his brand of collateral damage to the continent in the 1998 Al Qaeda attacks on the US embassies in Kenya and Tanzania. The grass always suffers... Back in 1998/99, he didn't care much for the limelight. I wouldn't want my jaundiced commentary to give the impression that there were no good leaders on the poster or in Africa in 1999. Indeed there were many good things happening on the continent and often inspite of the leaders. Also, and this is the great virtue of Africa at that moment, much of the action on the continent was in civil society, in entrepreneurs, in schools and in business. Governments mattered less. Ange Felix Patasse of the Central African Republic and Miguel Trovada of Sao Tome and Principe could argue for a passing grade in 1999 (later is a different question). Similarly Konaré of Mali - a country that probably has the strongest democracy on the continent, did good. The leaders of Malawi ( Muluzi ), Tanzania ( Mkapa ) and Botswana ( Masire ) were all sense and sensibility. Heck even Chisano of Mozambique was proving reasonable in reconciling his countrymen after their long civil war. For what it's worth also, Sam Nujoma of Namibia did no harm in 1999. Between a Dream and a Nightmare was how Human Rights Watch described Africa in their 1999 world report. There's a touch of hyperbole perhaps, but there is much to commend in their lyrical commentary. Africa in 1999 was a case of baby steps. Back to reading 1999... There was the matter of angels and demons, and I've previously pointed to contemporaneous posters showing the way in which religion had gotten a big boost in much of Africa. We were in need of much faith healing and the reason was leadership. Popular culture and the literature reflected as much. 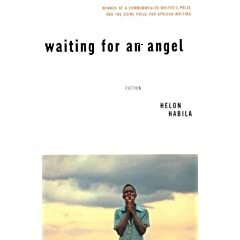 Nigeria, by virtue of heft, sets the tone for much of Africa hence, for the best reading material on Africa circa 1999, I'll turn to Helon Habila's Waiting For An Angel. This was actually a far more assured debut than that of The Anointed One in that is a novel that really sought to capture the totality of a society's experience of that moment. Habila is an ambitious writer and he presents a series of shifting but interlocking stories - the glue is a doomed journalist and a few students, but he covers considerable territory in his lyrical pages. In a sense it is the moral dilemma of Ayi Kwei Armah's The Beautyful Ones Are Not Yet Born, updated for the fin de siecle: will no one do the right thing? His laconic tone and journalistic eye really captures the mood: the sense of dread and inevitability of life under Abacha. Simply put it was a time of suffocation, of repression and of corruption. To call what Abacha wrought in Nigerian society bad behaviour is to give bad behaviour a bad name. 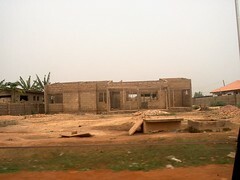 What took place in Nigeria was greed beyond belief and utter wickedness, leavened periodically with tawdry murders. Murder was most foul, theft was most blatant, and all relationships were corrupted. I can also point to some maternal toli with observations about this period; in 1999, it was a matter of confidence in Nigeria. Nigerians are still picking up the pieces years later. I haven't dwelled much on the francophone aspects but perhaps a few words are in order. France these days is having a touch of buyer's remorse at its back-scratching enablement of African rogues. 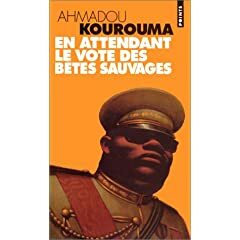 One then should also add to the reading list Ahmadou Kourouma's En Attendant Le Vote Des Betes Sauvages completed in 1998. That too takes on the Eyadema figures (and many of those other knaves I've listed). Magic realism was our lot and the great wordsmith doesn't disappoint in his cultural observations. Where Habila is waiting for an angel, Kourouma is waiting for the wild beasts to vote. A clear eyed look at the poster and at those leaders should explain why these two great stylists of African prose would write as they did about waiting for the next shoe to drop. If the one hoped for change for the better, the other was more cynical about the prospects - and perhaps given the slow pace of change in Africa, Kourouma had the clearer eyes. But as a matter of policy, I'll side with Habila; demons may have more fun but angels are more likely to inherit the earth. Between a dream and a nightmare is a twilight zone of opportunity; that is the terrain of the great game and the temptions of the rough beast. As we have seen, leaders do matter, but I'd hazard that people matter more. It wasn't so in 1999 but with baby steps, perhaps it is more so today. Would it always be so. Eric B. & Rakim - Follow the Leader Braggadocio and inner turmoil never sounded so good. Certainly Rakim never sounded so good, a microphone fiend he handed allcomers a musical massacre with his lyrics of fury . Follow the money, follow the leader. Prince - 1999 A double album opus with Linn drum programming mastery, the obvious line to contribute to the playlist is from the title track: "Party over, oops, out of time". I quite like some of the other, lesser-played songs on 1999: Delirious and the very apt Something In The Water (Does Not Compute) . What say you Dear Reader? Femi Kuti - Plenty Nonsense I was going to pick a Fela track to round of this playlist, perhaps Unknown Soldier - the line about Government Magic always gets me, but I think Femi had already proven himself by then and a more contemporaneous song was warranted. The title should speak loudly to my point: we're doing better these days but we all need to be vigilant about the plenty nonsense that goes on in our lands.